Menstrual Cups are awesome because they are so discreet and unlike, a tampon, can be kept inside for up to 12 hours at a time. Because of this, you can always empty your cup in the privacy of your own home at the start and the end of your day. But what if you have a heavier flow that day, and you need to empty it at work, or while running an errand? Using a menstrual cup in a public bathroom can be a bit daunting for new users to menstrual cups, but it really doesn't have to be scary! In this article, we are going to look at tips on using a menstrual cup in a public bathroom, how often to empty menstrual cups, and how to clean a menstrual cup while outside of your home! Some people will claim that the messiness, and inconvenience of cleaning a menstrual cup in a public bathroom will put them off using a cup. But that’s just an excuse! Emptying your menstrual cup in a public bathroom isn't too difficult. Especially once you have the hang of using your own menstrual cup. It’s very similar to how you would empty and reuse your menstrual cup in the safety and privacy of your own home. Trust me! Using a menstrual cup in a public bathroom is certainly not a reason to put you off using a cup. Especially when there are just so many good reasons to switch over from using single use tampons and pads! 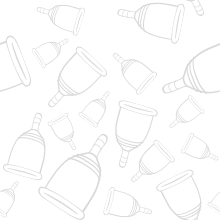 Check out our Comparison Table Between Menstrual Cups and Tampons here! Bathrooms, public toilets, or restrooms are usually quite small. But you will get accessible toilets in most common areas. These bathrooms are more and more common nowadays, and will be found in shopping malls, airports, and offices. These are usually for people with mobility issues, the elderly, or those with young children. These bathrooms are larger, and will have private sinks. Now, if you can easily access one of these bathrooms/restrooms, then using your menstrual cup will be very easy! You will have more space, and more privacy to remove, clean, and reinsert your cup following these steps. Remember to wash your hands properly, ideally using soap. Reach in to remove your cup using these tips! Tip the period blood into the toilet. Shuffle over to the private sink and rinse off your cup, then shake it dry. Reinsert the cup using your preferred fold, making sure the cup is sealed properly. Check there is no residue blood or mess anywhere in the toilet, ready for the next occupant! But What If There Is No Private Sink In Your Stall? Using a menstrual cup with no private sink or water supply might seem a bit scarier. And yes, it is slightly trickier. But never fear, because you’re going to do exactly what you normally would do when you were changing and using your tampons! Firstly, you would wash your hands before going into the stall. You can then do your business. I find it's much easier to remove a cup once my muscles are relaxed, and I've done what I needed to do. It also helps if your bladder/bowels are empty when 'bearing down' and pushing to remove your cup! Once you've wiped and dried yourself, grab some clean toilet paper and have it ready in one hand. At this point, you might want to hover over the toilet to make it easier to remove the cup. Reach in to remove your cup using these tips! Try to keep it upright so that it doesn't spill. Hold onto your menstrual cup securely. Do not drop the cup into the toilet!! Tip the cup out into the toilet. Hold onto it! If there are any stringy bits (gross I know, but you know exactly what I mean!) then use the toilet paper to wipe yourself. Give the menstrual cup a wipe with the toilet paper if needed. Though most times, the outside of the cup should be fairly clean as the blood is collected inside, not outside of the cup. If you really think ahead, you could even bring a small bottle of water with you (in your handbag for example), and rinse it off over the toilet. Double check to make sure there is no residue blood anywhere in the toilet, floor, or walls. You don't want to leave a scene out of Carrie! Then leave the stall, and wash your hands thoroughly at the public sink. Just like you would every other time! When you get home and into the shower, rinse off the cup properly when next convenient! How Often Should You Empty a Menstrual Cup? Menstrual cups are designed to be worn for up to 12 hours at a time. They are safe enough to be inside of your body for a long time with no risk of Toxic Shock Syndrome (something that can occur when wearing tampons for too long). Most women will find that they do not need to remove and tip out their menstrual blood during a normal 9 hour work day, or an outing to the beach or shopping mall. This means they can wait until their get home to empty and clean their menstrual cup. However, some women will have heavier flows, and find that they need to empty their cup more often. This is quite common and very normal. If you are using a menstrual cup for the first time, try to plan it for a day when you are at home. Then you can track how often you need to empty your cup. You can even check it every few hours, just to make sure it's working properly, and not leaking! How To Clean a Menstrual Cup in Public? You won't really need to clean your menstrual cup out in public. It is perfectly safe to just empty your cup, and reuse. But at least once a day (every 12 hours), you should properly rinse off your menstrual cup. Menstrual cups never absorb period blood, but some sticky bits can remain, so it's important to rinse your cup off under some warm water. The best time to do this is during your shower, and when you are at home. And of course, before and after your menstrual cycle, you should properly sterilize your menstrual cup by following the instructions that came with your menstrual cup. See our tips on How to Clean a Menstrual Cup properly! Menstrual Cups are such a healthy and convenient hygiene product that allows you to do what you want, when you want, with the freedom to not think about your period constantly. They are little awesome cups that collect your menstrual blood, and reduce huge amounts of environmental waste at the same time. They also save you bucket loads of money, and the pros easily outweigh the non-existent cons. Don’t stress about having to use a public bathroom when using your menstrual cup, as it really is just as simple as removing, emptying, and reinserting! Good Luck!! Remember to wash your hands before and after. Preferably with soap. Use a family or accessibility bathroom if you really need a private sink. Don't use scented wet wipes to wipe off the cup, due to the chemicals. Using disposable wet wipes aren't great for the environment either. Don't leave the toilet stall without first checking your hands and wiping them down. Don't be put off by using a menstrual cup in a public bathroom. It is going to keep you on the move for longer and you can go about your life without your period stopping you from doing what you want! Why Does My Menstrual Cup Hurt?